My name is Yvonne Rivas and I am a sophomore economics major participating in the Association of Research Libraries Fellowship for Digital and Inclusive Excellence with the Tamiment Library. 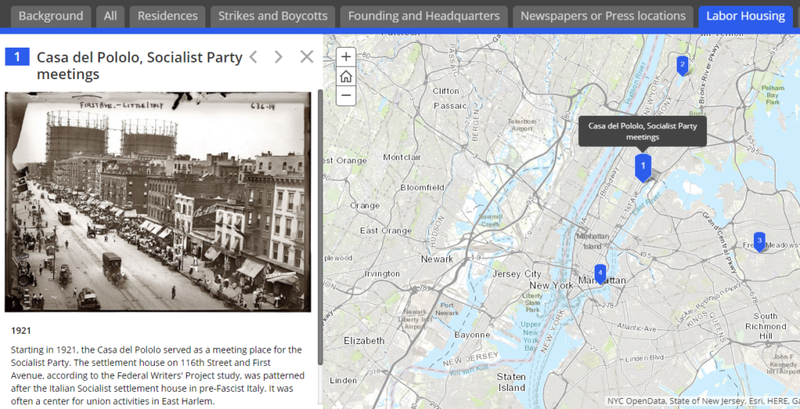 As part of my internship, I have been working on the New York City Labor History Map. The map began as a joint project between the Tamiment Library/Robert F. Wagner Labor Archives and the New York Labor History Association (NYLHA) at an unknown date. The original map was created using Google Maps by a former Tamiment staff member. This map is no longer accessible on the web, but the information was then transferred to a Google Document, allowing for edits and updates in the future. This project includes fact checking the map’s existing information points and locations and finding photographs to help visualize the corresponding historical events. I used photographs from both the Tamiment Library’s archival collections and the public domain. The map documents the history of working men and women in New York City and their struggles to gain concessions such as the eight-hour work day, better pay, improved working conditions, decent and affordable housing, collective bargaining rights, healthcare, and pension plans. It also documents important aspects of the city’s political and social history, major union leaders and contributors, and their work to better conditions for workers. My hope is that people who don’t necessarily get a chance to visit the archive and work with original materials will be able to use the map as an alternative teaching and learning tool. 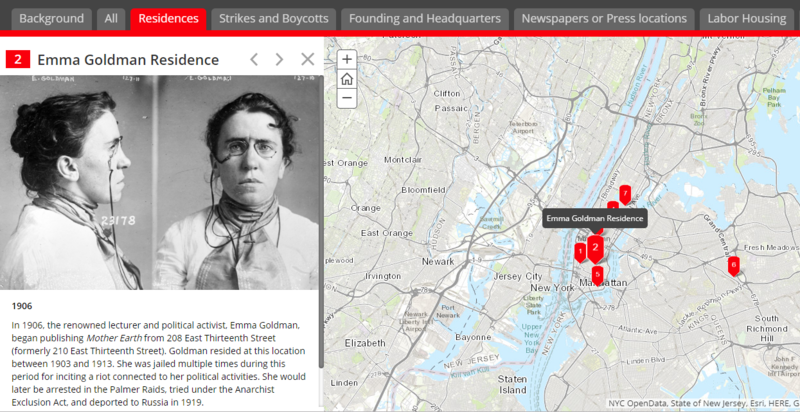 The map uses ESRI ArcGIS software and is broken into seven sections including: residences, strikes and boycotts, founding and headquarters, newspaper or press locations, labor housing, arts and education, and iconic New York landmarks. Users can adjust the tabs to look at one section or look at all points together on the all-tab. The map primarily focuses on 20th century events but also includes points from 1712 to 2003. My goal is to make the map an ongoing project which allows for future growth where new historical places relevant to labor history in New York can be added. The purpose of this project was to make this resource available again as well as to create an accompanying exhibit to give the map greater context. This is all a work in progress. I am currently working on the digital exhibition that will take an in-depth look at some of the unions highlighted in the map. I will conduct archival research at Tamiment Library to make this exhibit during Spring 2019. I enjoy working on this project because it allows me to gain a better understanding of the wide variety of digital projects that can be undertaken in a library. I initially became interested in working in libraries when I obtained my first job working as a page at a local public library and I wanted to work with digital projects at Tamiment to gain experience with Esri’s GIS software and also to get to do research using archival collections. I hope you’ll enjoy looking through this resource!